My guest this week is the Global VP of IT of Seacret Direct, Stephanie Nelson. 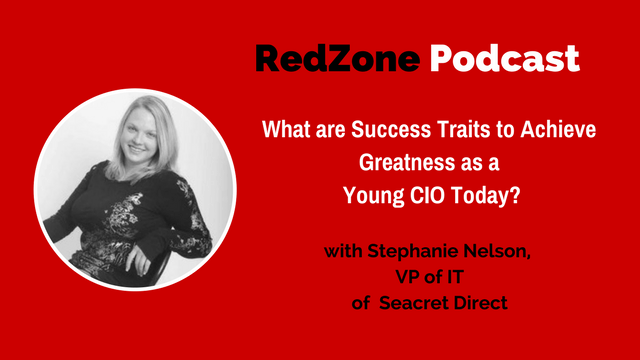 If you are a young IT Leader or the one that doesn’t want your clock cleaned by young talent, you need to listen to my conversation with Stephanie to see how someone, working with a rapidly growing worldwide company as a VP of IT, is executing. Stephanie Nelson is a senior IT Technical Lead, Senior Developer, and Technical Manager with 10+ years of experience and success with web-based software, database, virtual and cloud solutions, and client applications. She has extensive experience helping private sector, non-profit, and government organizations and teams transform and achieve success. Stephanie is a highly effective leader and communicator, who is able to collaborate and work with all levels of an organization. She achieved success developing and guiding on site, off site and off shore teams that design, build and deploy mission critical solutions, across a wide range of industries, in revenue generating production environments. Bill:	Stephanie, I want to welcome you to the show today. Stephanie:	All right. Thank you. Bill:	We've got to start off with this. How have you been able to achieve so much so young, as a CIO of this worldwide company? How did it happen? Did you always envision yourself doing what you're doing? Bill:	You ended up teaching the class? Stephanie:	Yeah. I wound up taking over the class a couple of times? Bill:	In high school or in college? [00:01:30]	Yeah. That was senior year. Then, from there, I kept learning different pieces. There's a lot of online tutorials. There's a lot of videos and things of that nature. I would take on a project because somebody would call me and say, "Hey, I know you're really good at learning this stuff. Can you do this?" I go, "Sure." I would learn on the fly as I'm doing a project and I gained the experience from all of that. I wound up taking on a bunch of projects. Of course, I was working for AT&T as one of their sales reps.
Stephanie:	Making commissions. I landed my first real job after I had gotten a portfolio built up, doing website design and development for several different radio stations. They were all under the same umbrella. That was my first real gig. You went to high school. I imagine that college, you probably were more advanced than most of the people in college. Stephanie:	I was actually trying to go to school to become a doctor. Stephanie:	A surgeon. Yeah. I wanted to be a surgeon. For a couple of different reasons, I couldn't do it. Stephanie:	The money ran out, basically. I fell back on what I knew, which is all of this programming and engineering and that kind of thing. ... self-learned and then you went out and found the radio station, had had a portfolio and just helped them build websites. Stephanie:	Yeah. They had several different radio stations, both in Ohio and Michigan. I would do the websites. The front-end design for them and do different pieces for them, update their content, all kinds of different portions, and learned, of course, as I went. Then, my next job, actually somebody called me and said, "Hey, do you want to come do this job?" The next thing I knew, I went from being a front-end developer to all of a sudden, I was managing the entire department. Stephanie:	Yeah. Providing policies and procedures on how we should program and how to make everything work better together. Working with the programmers on that side and the designers and the front-end developers. Yeah. Bill:	Being self-taught, were you ever nervous about having to learn 100% your own or did you ever have a mentor to help guide you along the way? I had several mentors along the way. I'm always learning something. Even to this day, I'm still learning. I have amazing developers who will still teach me things. We tease each other all of the time that they're schooling me, or I'm schooling them, or whatever you want to look at it. The general idea is, is that they're always ... He stole your mic. Bill:	We have a little guest here. We have Milo, the ... What kind of cat is it? Himalayan playing with the sound mic puffball. That's okay. I never use this one. He can play with it. [00:04:30]	Okay. Basically, it's one of those pieces where I've learned so many different aspects from so many different people. I've learned everything from project management, how to think completely differently because being self-taught and being a nerd, basically, it means that you get into a public situation and all of a sudden you can't talk to anybody about anything because you're speaking so much geek, or Greek, or however you want to put it, that nobody understands what in the heck you're saying. It took me a long time and I had several people really work with me to be able to eloquently put my non-nerdy ideas into a form that everybody understood. Bill:	What did they teach you? Stephanie:	It was white boarding, honestly. Stephanie:	I had a really good mentor who sat me down one day and said, "Stephanie, you're absolutely brilliant. You know what you're talking about but I can't understand a word that comes out of your mouth." Yeah. He was brutally honest and it really helped. It really made a big difference. He said, "Try explaining this to me, again, like I was five." Bill:	Okay. That's a good one. [00:05:30]	It really did help. It made a huge difference and I wound up getting frustrated during that conversation. I understood where he was coming from but it was one of those situations where I was like, why don't you understand it? It finally clicked that day, that he doesn't understand all of the technology terms and he doesn't understand the implications behind them. He worked with me and I started drawing it out on the whiteboard in five year old language. He said, he goes, the phrase that I remember and it always stuck with me is, "You're teaching string theory to a four year old." Bill:	String theory to a four year old. BIll:	I love that. I love that. [00:06:00]	That was how I started approaching things. I even tell architects and developers that when they ask for advice on how to have meetings. You're teaching string theory to a four year old. Stephanie:	It was basic concepts. For servers and databases, I would draw out a picture. I started to explain, "Database is basically Excel tables and spreadsheets. You're combining those spreadsheets together end you're making pivot tables," because, as a project manager, he understood those terms. Databases are obviously more complex than that but he understood the basics and how it integrates into the front-end of the site. How all of that functions together. I would draw it out on the board for him, with arrows, and explain, walk him through the process and say, "Here's your problem here," with a big red arrow. "This is why it's not talking to this server here." Bill:	System interdependencies and dependencies. Bill:	... of where something's broken without a four-page research paper. [00:07:30]	Exactly. Then, he could also say, "Well, what happens if we tried to do this?" It was legitimate. Then, we could have a legitimate conversation because he had experience in other areas that I didn't. He could say, "Well, can't we circumvent this whole piece and why not just do this and move on from there?" Yes. He was correct in some cases and in other cases, he wasn't but at least it allowed him to have an understanding and a legitimate conversation at that point. Bill:	I use to call those John Madden diagrams. Bill:	I used to, early on when we were trying to talk about security, it's so complex with so many moving parts that everybody remembers the old days when the football diagrams are on the board and they're trying to use the X. Bill:	The X goes around this and it goes around. It's like, yeah, this is the John Madden. Bill:	Okay. I got it. Stephanie:	Yep. It's the same basic concept, except for I like to use multiple colors because it just makes it more entertaining. Bill:	Wow. That's really, really, really cool. Is there any other mentors that were ... That allowed you to speak to the team, for sure. Speaker 1:	What about to your peers or the C-Suite? [00:08:30]	To most of my peers, talking geek is pretty simple because it already comes naturally. The biggest piece is it gets interesting because sometimes people are not always on your level. Sometimes they're higher than you, sometimes they're lower than you. It just depends. Stephanie:	Being able to talk to all of them, sometimes you do have to go down to a different level and just say, "Okay. Let's draw this out on the board and make sure that everybody understands and we're all on the same page." That one has always been relatively easy for me. [00:09:00]	The harder portion has been the C-Suite. As I moved up in jobs and as I went into new environments, explaining very technical concepts to non-technical people became more of a challenge. Again, I went back to a couple of different people that I had worked with before and I said, "Okay. This is my problem. How do I explain this to them so they understand?" [00:09:30]	Again, they gave me some pointers and I have several people that I still talk to on a regular basis, about all of these kinds of things. It's interesting because one of them, I actually work with now, and she's been fantastic for breaking down very technical concepts into very easy to understand language. She's a translator, as she calls herself. She's been amazing on helping me break everything down for the C-Suite. [00:10:00]	Most of it does revolve around drawing on the whiteboard, printing out images. You have your website and drawing a house to show that's your homepage. Something simple, a concept with, she goes back to cars a lot of the time, explaining how a car functions. You have to have the engine and you have to have the wheels. If it doesn't turn over, then what happens? [00:10:30]	Interesting. Now, this mentor, is there any specific breakthroughs you had? Is there a specific situation that happened that you were completely amazed by, or it was a shot in the dark, or you had an intuitive moment that you were standing up on the board and you were like, "Gosh. I'm not getting through to this person?" and all of a sudden, boom, you write it up there and it made a big deal? [00:11:00]	There's a few of those times. It's mostly been ... It's been on both sides, actually. It's been with new development teams when I come into a new environment and I work with new architects and new developers that I've never worked with before. It's also on the executive level. Explaining to them, because some of them are extremely technical and they've just been out of the industry for 10 years or 15 years. [00:11:30]	Going back to what they know versus what current technology is, can sometimes be difficult. I would sit down and I would explain to them. It wound up being the same thing, going back to the whiteboard and saying, "Okay. These are your current systems. This is currently how it operates. Here's how the data flows. Here's the direction." Then, I would say, "Okay, but what happens when this happens and what happens when this happens or if something else comes into the mix?" I'll go back to the car metaphor, "What happens if you get a flat tire?" Or "What happens if you don't have a spare?" Or "What happens if everything suddenly goes down? What is your fail over? What is your backup?" Bill:	... and draw almost what-if situations from it. Stephanie:	It's more of asking pointed questions. [00:12:30]	It's not really saying, this is where the architecture is bad. It's more of asking pointed questions of saying, "Okay, what happens in this scenario? How do we handle this scenario?" Because, ultimately at the end of the day, my job is not to solve every single problem. My job is to ask very pointed questions and make sure that everybody in the room is coming up with an answer together, regardless of what level they're at. Bill:	How about if you're someone like yourself who probably already knows the answer and you're in a group of folks, or your team, how do you restrain yourself? [00:13:00]	Those are the most fun. Those are honestly the most fun conversations. I will usually pull a brand new team into a room, into a conference room. It usually takes be about a week to understand the general architecture in the systems and how they integrate and where the data goes and everything else. I'll start out and I'll draw out my diagram for whatever project it is, with all of the servers out on the board and using multi-colors. Then, I will sit down and I'll go, "Okay, guys. Is this how this works?" Sometimes they'll get up and they'll say, "No, no. This one goes over here. This one goes over there. The data doesn't flow that way," blah, blah, blah. Fine, no big deal. I don't expect it to be 100% perfect. Stephanie:	That's not the object of the exercise. Then, from there, I'll say, "Okay. Let's say you're starting brand new. Today is your first day. You've never met me, I've never met you. What would you do in this scenario if you walked into this? Is this how you would have architected things? If you had your druthers and you could do anything you wanted to, how would you have architected this?" [00:14:00]	Usually, there's a silence for about four or five minutes while they sit there and look at me like, "Is she serious? Does she really know what she's doing?" I say, "Really, guys. Go for it," because it's mostly guys. I say go for it. "I'm just here. You do your thing. I'm here to observe. You have fun. I'm not going to judge you." BIll:	The observer effect. Okay. Stephanie:	Yes. I said, "I'm just here to watch. You guys have fun." Stephanie:	Right. Exactly. They start talking and it comes slowly at first. Then, all of a sudden, you hear, "This whole system is such crap." "Oh my God. She's actually giving us an opening ... "
Bill:	" ... to actually redesign this?" [00:15:00]	Yes. "Holy cow. I hate this about the architecture," and "Why would anybody do this? This is so stupid." When you get to that point, you're good because now all of a sudden, you can start to see where their skillsets lie and how they're thinking and why they're thinking that way and what their experience is telling them about the current architecture. Yeah. It's a bit of a venting session but it's also one of those situations where you can learn so much about them. Stephanie:	No. It's a lid. Bill:	It's a lid, across the floor. It's great. We've got some good background noise. What's interesting about that is that you are in that process, really uncovering skills. Bill:	Thinking how they think. It's mostly a change of mindset because a lot of developers get put into ... They get very comfortable. Regardless of the management, they get very comfortable in their position. They get very comfortable in their little hole, or their little, whatever you want to call it. They wind up only programming in their little area. They know their area very, very well but then comes the whole hit by a bus, wins the lottery, whatever. The inevitable happens where nobody else knows what is going on in that area. [00:16:30]	This becomes a major piece because now all of a sudden, you're changing the mindset from saying, "I'm going to stay in my little corner and I'm going to program my happiness in my little corner," to all of a sudden you're saying, "Okay. Let's get out of your corner and see what else is out there. You know your little corner and he knows his little corner. Let's put those ideas together and see if you guys are both doing the exact same thing and just don't realize it." Bill:	Interesting. You know the architecture going in, for the most part. Bill:	Flushing out those little siloed efforts in fostering the team without actually ... Okay. That's really, really interesting. I'm not actually doing anything. I'm literally there to observe, to get them to work together as a team to change that mentality from, "I'm all by myself and I'm going to single handedly do everything myself," to, "Hey, let's talk about this. Let's see what we're doing." At the end of the day, it's really, it turns into managed chaos, is really what it is. Because, I go into this with my own expectations and I go into this saying, "Okay. I know that the architecture shouldn't be this way," or "I know that this project shouldn't be run this way. Here's my opinions." [00:17:30]	Along the way, when there's lulls or when it starts getting really off-topic or when the venting goes a little too far, I ask probing questions. I say, "Okay. What happens if this were to come into the mix?" Or, "What about if we did something like this?" [00:18:00]	... along the way where ultimately, 99.9% of the time, they're going to come back to what you were saying and they're going to agree with everything that you say. It's just allowing them to get there on their own. Bill:	Interesting. You seem very confident in the unknown or of moving through the unknown. Stephanie:	It's fun. It's a lot of fun. You have some really brilliant people and to sit here and pretend like I know everything, is not going to win any friends. [00:18:30]	The ultimate point is, is whether or not I'm right or not, I still won because everybody in the room is going to be agreeing on whatever the final piece is. They're all going to ultimately work together, harder and much better and much smarter, than they were working alone. Bill:	Interesting. How do you foster an innovation mindset within your teams? What I mean by that is, willingness to fail. Stephanie:	That is a difficult one. Because a lot of people in the IT industry as a general whole, have very big egos. All of us because we're all the smartest person in the room and we all know more than everybody else. Ask anyone in IT. We are always the smartest one. Yes. It's all downhill from there. It's, unfortunately, the truth. Working around those egos is the hardest piece because failure to them, is not an option. Failure means quitting. [00:20:00]	For most developers, let's say you entirely change the programming language and the direction of the company. All of a sudden you're going to have a bunch of programmers who are extremely, A, upset, B, they've been taken not only out of their little corner but now they're also being forced to change programming languages and technologies and everything else, and C, you're hurting their ego because now they're having to learn something and they will fail. Stephanie:	It's a very difficult process to be able to either train them, or build them up, or let them go. It's one of the three is going to happen. Working with them and explaining to them, "I expect you to fail." Stephanie:	That is one of the biggest things because they look at you funny like, "What did you just say to me?" Bill:	... basically took it out as being a point of concern. Correct. Ultimately, the entire piece is, is explaining to them that, "Okay, yes. This is a massive project. It's huge. Your core pieces are here though. Those are already completed," or "Maybe we're working on those core pieces but you're only doing small little bits. If this little bit fails over here, it's not a huge deal." Stephanie:	"You're just going to put in your bit of code. We're going to test it. If it fails, okay. No big deal. We'll find another way." It's that fear that they're failing and they're going to upset you and they're going to lose their jobs, it becomes one of those things where you get them to talk to you or you get them to talk to one of your managers who then tells you, that it really makes a difference. Also, the team mentality makes a huge difference because if they're talking to their managers, if they're talking to the other guys that they're programming with, or girls, and they're saying, "Hey, I can't get this to work. Hey, have you guys figured out a solution for this?" It builds that mentality and it helps them to work together as a team. It helps them to become a stronger team, ultimately, in the end, because they'll wind up working on the whiteboard and hashing out issues together, which means you're going to get a much better solution than you could have ever thought of on your own. They're going to wind up working together to come up with one solution that can probably be reused across multiple different projects. BIll:	What do you think the role of a business analysts is, in the mix? Asking very good pointed questions. Bill:	Do you end up training them as well? Stephanie:	To a certain extent, yes. [00:22:30]	Most business analysts, they will ask questions that I forget about but they will ask a number of questions and very pointed ones. They tend to know the business better. That's a whole other piece but essentially what I always tell everybody in the IT Department is, is you need to understand how the business works and why it works. Whether it's government and you're building financial data or it's some small company that you're working with, you need to understand what their business model is, how they make money and what you can do to improve it. [00:23:00]	Because, ultimately at the end of the day, we're all replaceable. We really are. If you can create something, if you can continue to innovate, if you can go home ... Because all of us in IT, we go home at night. We read articles and we program and we do all kinds of crazy things, play video games. At the end of the day, they're going to go home and they're going to wind up thinking about it because that's what we all do. When they wind up seeing other things that other people are doing or read other articles, if they can come back and say, "Hey, look. This is really cool and this really made a huge difference and they're in the same industry that we are. We should totally do something like this, except we could do it this way," you wind up being able to present to the business instead of the business coming to you, which gives you a totally different point of view on IT. BIll:	Is that one of the pieces you try to really foster? Because that's not offensive, that's playing offense. Stephanie:	Correct. It's changing the mentality around IT. Stephanie:	Because most of the time, IT is viewed as, "Hey, you're here but we don't really notice you unless something breaks." Bill:	"We're going to toss something over the fence to you." BIll:	Hope you can catch it. Stephanie:	Right. Why isn't that done yet? Stephanie:	Absolutely, because you don't want, here we go with the ego thing again, you don't want them coming to you and going, "Hey, look. I saw this new shiny thing. Look at how cool this is." BIll:	... that you're involved in right now. Stephanie:	The business that I am in right now, they're a global company. We hire in seven different countries right now and we're opening up two more countries in the next two years. [00:25:00]	Actually, next year. I'm sorry. It's a growing company. It's a growing industry. They're doing very well and it's keeping up with what they have and innovating all at the same time. It's a lot of fun. It really is. They've basically given me free reign to do what I need to do. Then, I go back and I explain very technical things to them and it's a lot of fun. It really is. They're great. They're absolutely wonderful. Bill:	Do you have a chief marketing officer? Stephanie:	No. Not right now, we don't. [00:25:30]	We do have a Marketing Department. I have been working with them on a couple of different things, like you mentioned Facebook. We're trying to change the marketing strategy because the company that I'm with, they offer everything from lotions to body butters, to haircare, to all of these different types of products. ... and why it should work this way and how to drive traffic. I'll tell you a story because it's ridiculous. To explain some of how the social engineering and all of this works, I was at a company and this was a couple of years ago. We were working on a, I don't remember what it was but we were messing with this one guy. We were using Gmail at the time and Google, obviously ties into everything. Their API goes throughout Facebook and YouTube and Amazon and everything else. It all integrates, ultimately. [00:27:00]	We started sending him emails with the very bottom of the email, in all white, all caps text, the word spoon over and over and over. He didn't see it because it's in all white at the bottom of his emails. Of course, he never saw this. All of a sudden, about a few days later, and all of us were doing it and he's getting all of these emails and they're very long because you paragraph down all the way down to the bottom of the page, all of a sudden, all of these Amazon ads started popping up for spoons. His Google search was showing spoons. Everywhere that he looked was showing ... Facebook was showing spoon ads. [00:27:30]	YouTube was showing spoons. He comes into work and he goes, "Stephanie, you're the technical person. What in the Hell is going on?" I couldn't keep a straight face and I finally had to show him what we had done. Bill:	You're tricking the algorithms. Stephanie:	Yeah. Now, everything, everywhere he went had spoons. It was a good three weeks before he could get rid of them. ... where it starts to get predictive marketing. That's one of the pieces that I've been working with our Marketing Department on, is how to predict what another person is going to want to purchase based on their browsing history, based on the sites that they've visited? What types of information can we show them based on their browsing history? [00:29:00]	For example, all of the products at the company that I work with, are from the Dead Sea. They're all natural. They're great products but how do I get that to somebody who may be searching for non-GMO related foods or someone who's looking for haircare products that don't have all of the extra chemicals in them? There's so many different options to be able to set all of this up and that's ultimately where I think all of us are going. That's really going to affect our marketing and our industries and everything else. BIll:	Are you actively working with them to target advertising to local regions? Yes. We do everything from getting analytics on our websites to see where people are coming from, what the IP addresses are, which countries they're coming from, which is standard, to finding out salary range, age range, how many children they have, what types of music they're into. Stephanie:	All of that kind of information is extremely usable and it can help you. Okay. For example, most of our market in Korea is obviously Asian. [00:30:00]	Female, between the ages 30 to 40, usually has two children and they make around $50,000 in salary a year. What does that tell you? Okay. That means that they're probably a stay-at-home mom, they don't work. They're interested in their appearance. Stephanie:	Our body butter cream would be great for a person like that, as an example. Stephanie:	There's just so many different items and so many different ways that you can take this information and actually do a direct marketing approach to them. Bill:	Yeah. We can use the magic site, Google.com, and you can learn pretty quickly. I personally believe Facebook is going to be the new television. I think you've got Twitter/ABC, Facebook/NBC, Snapchat's going to be CBS and that we learn to dominate Facebook. There is so much video content and it can be really right in your news stream. It doesn't even look like advertising anymore. Bill:	It's buried right into it. [00:31:00]	They've completely changed their advertising model, which is good and bad all at the same time. Most of the advertisements now are similar to Facebook. Where, it used to be a few years ago, you would have a 300 by 250 ad and it would be you would have to read around the actual advertisement. Stephanie:	Because we started out with a third column or a first column of advertisements. Everyone started having popup blockers and advertisement blockers. You naturally can train yourself to not even look at that third column. That's when the gamification started coming in and people would play games and you would get free money, or free product, or whatever. [00:31:30]	Then, ultimately, they switched to this 300 by 250 where you had to read around it or put in a row where you had to read around the actual advertisement. Now, what they're doing is, is they're actually changing it so it looks like legitimate content. [00:32:00]	It actually is legitimate content. Industries are spending so much money to find legitimate content. Again, I'll go back to just what I'm working on now, which is our products. Finding out where the Dead Sea minerals come from. Why are they so important? How do they affect your body? All of the good results from that. Everything like that could be considered legitimate content because it is. Posting a couple of photos, easily I can put it into my newsfeed, which will go back to my history, my browsing history. You already have a warm sale right there because they're already searching for those kinds of items. Then, you're going and you're presenting actual content and actual information, so you're going to get much better results. Bill:	... and put it very conveniently for them. I find this huge because I think the CIO has to realize that it is so hard to get a lead in business. [00:33:00]	It is so hard. Once you have it, that's the hardest part for sales reps. That's why so many fail, is they can't get a lead. If you can put a gasoline on the fire of finding leads, then the relationship building can build after that. It's like we're in the winner's circle to actually help sales. Bill:	... to do this. [00:33:30]	That's correct and most of it is turning into IT and internet now. For example, you have analytics on how many times somebody comes to visit your site before they purchase. The average was six to seven times before somebody would actually purchase your product on your website. It's gone down considerably but that still means that people are not immediately purchasing products. That means that we're now all required to give better content, better information, show them why. Stephanie:	Value added. "What is the value to me? Why am I going to purchase this and why would I use it?" Reviews have been another major piece that have come onto the market. People are actually starting to spam Amazon, for example, with fake reviews in order to be able to up their Amazon purchase. Yes, and their rankings. It becomes a very fine line of, do we spoof the rankings and reviews or do we offer legitimate content? It's a bit of both, to be honest. It really is. It's a bit of both. Stephanie:	If you have a legitimately good product and you put legitimately good content out there and you explain to people why it's good and you can put all of these different analytical pieces in, you wind up doing much better. [00:34:30]	You can have those sales and you can have that ROI. You can even see, let's say we're going to set up two different landing pages or 16 different landing pages with different layouts and different content in it, you can see how they perform based on the actual content itself. Bill:	I love it too because now you can take actual email addresses of valid ... It's super interesting. You can have, let's say 1,000 of your buyers in a specific targeted market. Bill:	... that would want to see this content. Bill:	... could walk into the Marketing Department tomorrow and be like, "Hey, did you know you can do this?" [00:35:30]	Absolutely. It's massive. There's so many different ways to be able to provide targeted marketing. There's so many different ways to be able to provide content to people. It's amazing, the number of analytics and pieces that you can get out there. Another good example is, is for example, on your website. If you want to see where people are clicking, there's all kinds of platforms out there that you can actually show heat maps of where most people are clicking, where they're reading, because most people will hover over content as they read it. Stephanie:	If you get a heat map of your site and you can show where they're hovering and what they're reading, most people are not going to read entire paragraphs of data but they will read bullet points and they will hover over those bullet points to read them. What does that allow you to do? It allows you to target the specific words or content that you want your market to have. It allows you to show them specific images and different pieces that would relate to them. Of course, using different analytics and numbers that you have, you can say, "Okay, this person's browsing history is they looked for non-GMO products. We can show them that ours is non-GMO as the very first bullet point." Stephanie:	All of this is completely interchangeable based upon where the person comes from. Bill:	What are some of the tools that you recommend? Okay. Right now we mostly use Google Analytics. Stephanie:	We have a program called Quantcast. That will show you salary ranges. It'll show you all kinds of different information. Everything from gender to children, to favorite music, TV shows, everything. Stephanie:	Q-U-A-N-T-C-A-S-T. Then, there's another one called Crazy Egg. Bill:	I've heard of Crazy Egg, sure. [00:37:00]	Yeah. Crazy Egg is a heat mapping tool. Of course, there's a bunch of other ones as well, that are great. Stephanie:	I have no idea of that one. Bill:	... people are going and then develop keywords based on that. Bill:	... it's a wide opening for us CIOs to take advantage of. It is and it's a lot of fun because you're innovating and you're coming up with new ideas. You're saying, how can we grow the business? How can we make it better? What can we do? Social media has become such an outlet for some of this stuff. You can post everything from crazy, what is it? We did a smear campaign, schmear, where we showed a bunch of different products and we would smear it across a piece of paper. [00:38:30]	We would have people guess what the product was. It's just fun little events or fun little pieces like that. We had so many people playing this game. It's ridiculous because who has time to sit here and go, "Well, that's that product"? But they do. They absolutely do. It's all of these fun, silly pieces that are really, honestly, doing the deed for you. If you have decent Facebook, if you have decent Twitter, if you have all of these other pieces, what winds up happening is other people sell your product for you. We have people approaching us for, we have a mud mask that it's magnetic. Stephanie:	You put it on and when it dries, you use a magnet to pull it off. It's really cool. We have people who are bloggers and social media experts who are actually approaching us to take these products and show them on their websites and show them on their YouTube videos. We're not selling it at that point. Stephanie:	We're giving it to others to sell. Bill:	Interesting. Now, is that Instagram influencers? Stephanie:	Oh, yeah. Instagram, YouTube. Stephanie:	No. We're not even paying them. Stephanie:	They approach us because they saw our social media and they tried out our product and they loved it. Stephanie:	They are approaching us. We're not even having to do anything. Stephanie:	Having those kinds of things and obviously we could approach more and we want to approach more because this is free advertising, essentially. Stephanie:	Yes. There's so many ways. Bill:	... someone with a million rabid followers. Stephanie:	Exactly. All of those million are going to watch that video. That's a guaranteed piece versus where you're paying per click on Google advertising, there's no guarantee that somebody's going to buy your product. Stephanie:	Or even view that. [00:40:00]	Yeah. What message do you have, for CIOs or people that are moving into the CI ranks? What has been, you think, a lesson learned that you say if you had to do it again, you would do it a little bit differently or would you follow it exactly the same? Stephanie:	I think everybody would do everything a little differently. I don't think I can say with absolute certainty that I would do everything exactly the same. I would not trade my experiences. [00:41:00]	I absolutely wouldn't. I've had a lot of good experiences. One of the big things that I've come away with is it is my role, no matter where I'm at, to teach. Because, in IT, we have so many complex pieces. We have so many areas that we touch. Everything from actual shipping out of warehouses to systems, to managing computers and actual hardware marketing. We even touch that. There's so many different areas that we touch and there is so much learning that we do. Teaching that to others, both above and below you, is extremely important. [00:41:30]	For example, I go into meetings with the C-Suite and they come up to me and they say, "Hey, look. We found this really cool company and they're going to do this and this and this for us." I go, "Yeah, no." If I don't give them any explanation as to why, or what is wrong with it, or why we shouldn't move in that direction, they're going to come back in six months with another company that does the exact same thing and they're going to push it even harder. The whole goal here is explaining to them why we're doing what we're doing, what the technology is behind it, why it's a good technology. All of those pieces, it's our job to do that. Bill:	Learn at the teaching. Bill:	The teaching piece. Okay. [00:42:00]	Everything from the developers and architects and programmers below you to the C-Suite above you, because ultimately you can lead the developers and programmers and architects and everybody else below you to say, "Hey, why don't you guys research this? Don't take my word for it. Come back to me and tell me what you think is wrong. Do some research and come back." They'll come back and they'll do that research. They may disagree, they may agree with you. It just depends but if you're able to have an intelligent conversation, they'll respect you. Stephanie:	The C-Suite has a different view, in that they want to understand the why. That is the biggest piece. Stephanie:	Why are we not going with this company? Why is it that we don't need their help? What are they offering? Did you serendipitously bump into mentors or did you go actively searching for them? Did you find them in books? I know you did people but is there websites, books and people or did you just, as you needed the help, you just all of a sudden found the help? Stephanie:	It's been in every job that I've had. Stephanie:	To be honest. I haven't actively gone looking for mentors. They pop up as you need them. It's been one of those situations where I'll run into a problem and usually somebody else at the office is having the same problem. You wind up talking about it with them. I have learned, and I'm young enough, I have learned to draw on people both below and above me. To be honest, some of the best people, are those who are on the ground, who are in the weeds, who can see everything as it stands. That has been the biggest piece of learning because they can go, "Stephanie, this doesn't make any sense because how are you going to do this?" Bill:	That's great. I have really learned a ton and I really appreciate you for the time we spent together today. Do you have anything that you'd like to end with as we wrap up? [00:44:00]	I don't think so. I think most of it is just I like to keep learning and keep going on. There's so many interesting pieces. There's so many interesting things that are going on. We have so many new innovations in IT. It's such an exciting place to be. It really is. BIll:	... to your web DVR experience? Yeah? Stephanie:	Absolutely. Yeah. That's really where I want to go. Experimenting with some of the artificial intelligence and experimenting with some of the VR. Yeah. I really think that that would be a lot of fun. Stephanie:	It will because most of our clients are using it on their phones. Some of it will be just fine, some of it won't. Stephanie:	It depends. Because most of us are reselling products, that's really what the business is, they would have different VR for different videos and different games and different events. You can do so many different things. You're reaching new areas. You're reaching new people that you couldn't have reached before because of the internet and because of these different pieces. This is great, very exciting. I want to thank you for coming on the show. Stephanie:	No problem. Thanks for having me. This entry was posted in Blog, podcast and tagged Bill Murphy, CIO, CIO Scoreboard, CISO, creativity, data, innovation, IT, IT Security, leadership, RedZone, RedZone Technologies, Tech Experts, technology, visualization on June 30, 2017 by Bill Murphy.